This is a delicious low carb crispy chicken dish. We have been on the low carb journey since January and one thing that I can say I do miss is the crunch you get with some foods. So when I was doing some research I found a few different ideas and decided to try it out with this dish. I made a brine for the chicken pieces to make sure they stayed juicy, it only takes 30 minutes once you have the brine, if you do not have the time, just make sure you season your chicken pieces before you coat them, it will make all the difference. 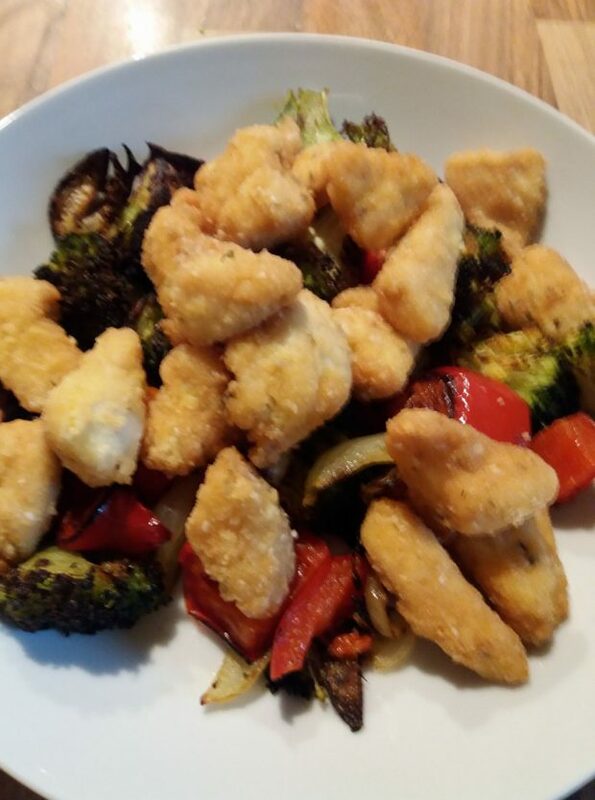 Delicious juicy chicken pieces with a crispy coating and roast vegetables, ideal for a mid week meal. Place the water into a medium sauce pan and heat over a medium heat. Add all the other ingredients until the salt has dissolved. Remove the saucepan from the heat and leave to cool. Clean and cut the chicken breasts to bite size pieces. When the brine is cool, place the chicken into a plastic container and pour over enough brine to cover. Cover the container with the chicken and place in the fridge for 30 minutes. Place the coconut flour, almond flour, baking powder and seasoning into a bowl and mix to combine. Crack the egg into a small bowl and whisk to break up. Add salt and pepper to taste. Remove the chicken from the fridge and drain, discard the brine. Heat your deep fryer to 200 degrees c.
Place some of the chicken pieces into the egg and then into the dry mixture. Do this in batches, to make sure you get all your chicken pieces covered in the egg and then the crumb mixture. 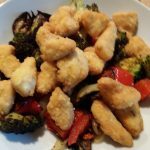 Place the coated chicken into a dish, when all covered, add some chicken pieces to the basket of your deep fat fryer and cook until browned and crispy, probably about 5-6 minutes for each batch. You need to make sure each chicken piece is cook through. Pre-heat the oven to 220C conventional/200c Fan/Gas 8. Chop the onions into chunky slices and add to a bowl. Chop the broccoli into bite size pieces, I like to cut each floret in half so there is a flat edge to get nice and browned and crispy. Add to the bowl with the onions. Slice/chop and de-seed the red pepper, add to the bowl with the other vegetables. Toss the vegetables together and add the oil and seasoning, toss again, then tip the vegetables onto a large baking tray, spread out so it is all in one layer. Place the tray into a hot oven and cook for 20-30 minutes, mixing during the cooking time, so you get some browned/crispy pieces.